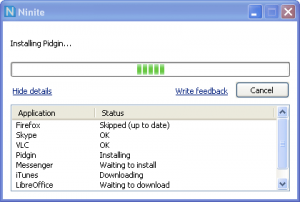 Load your PC with All the Necessary Software Painlessly and For Free! Do you dread wiping the stuff of your PC or even getting a new PC because of all of the time and effort it takes to put all of your favorite programs on the machine? Having a fresh machine (whether it is new or just a reinstall of Windows) is nice and the speed boost that comes with it is quite enjoyable but it tends to lose a lot of the appeal when you realize just how much stuff you have to install on it. That is one of the biggest reasons behind why people don’t buy a new computer until they absolutely have to or wipe their hard drives only because something has gone so terribly wrong (like a nasty virus) that they can’t help by wipe it clean and start from scratch. There should be an easy way to alleviate this dread shouldn’t there? Well, there is! There might not be a hassle free way of getting your data back to where it should be (although many online backup solutions make it a lot easier), but there is a way to make putting all of your favorite apps like web browsers (such as Firefox and Chrome), chat clients (like Skype and Pidgin) and media software (like iTunes and Spotify) on the machine in a relatively quick and painless manner. In the past, you have had to search out all of the programs you want individually to download and install them which would often take hours to do. Whenever I get a new PC or have to reformat my hard drive, I have always set aside an entire Saturday or Sunday to do it because I know that by the time I install all of the Windows updates, drivers and software, it is going to take nearly the entire day. However, it no longer has to be that way! Thanks to a service called Ninite, you never have to worry about it taking all day ever again! What is Ninite? Ninite is a service that lets you download all (well, most likely all) of the software you want all at once and install it with a single installer. Thanks to ninite, gone are the days of spending a seemingly endless number of hours clicking the next button on a ton of installers. With Ninite, you select just the software you want, download the installer and it will download and install all of the software for you without you having to mess with dozens individual installers. Not only that, but it checks to make sure the software is the most recent version and it will install the appropriate version for your machine (32 or 64-bit). Nearly all of the software you can choose from is free although there is the very rare exception like Microsoft Office which is a trial version and Mozy which is an online backup service you have to pay for. However, if you are looking for a quick and easy way to install your favorite web browser, anti-virus and anti-malware software, media software, messaging software, office software, online storage software, developer tools, and a lot more, check out the free Ninite service! It is a one stop shop for your essential software needs! Whether you need to install all of your favorite programs on a new PC or just get back up and running quickly after wiping a hard drive, this is perhaps the best and easiest way of doing it. Do you know anybody who would have a much easier time with their computer thanks to a service like this? Then send them a link to this post and tell them to share it with their friends too! Don’t forget to sign up for our newsletter on the right and like Penny Hacker on Facebook too!